Last Friday I received a nice little surprise from the UPS guy…. Yep. It’s a box of books. MY books. As in, one I wrote. I sometimes can NOT believe it. Still. Even after my third published novel. 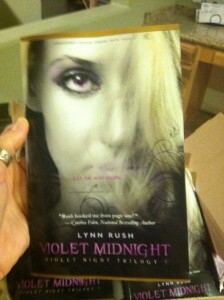 Here’s one of me holding the book. Again, that’ll NEVER get old!! And the first few things I thought…. 1. Wish my hubby would get home, like super fast, so I could share this awesome moment with him. 2. Wish Lynn was here to see this. Well, my hubby arrived home from work just a few minutes later and after much SQUEEING and jumping around (mostly on my part) I went on to thinking about Lynn. 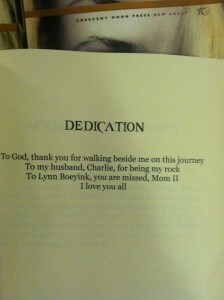 So, I flipped to the dedication to see her name. Even though the LYNN Part on the front of the book is in her honor, I still wanted to see. October 24th marks one year since cancer took her life. She is one of the main reasons I donate a portion of all my book sale proceeds to cancer research and treatment (American Cancer Society.) Lynn was an inspiration to me, having read the very first thing I ever wrote (and not laughing hysterically at me). She was a great writer. Never pursued publication or anything, but has journals and journals of stuff. And, she wrote something for my wedding day which had everyone tearing up at the church! She was amazing. So, Lynn, I know you’re sitting at the feet of Jesus right now, chatting it up with him, but I hope you know this book is for you. 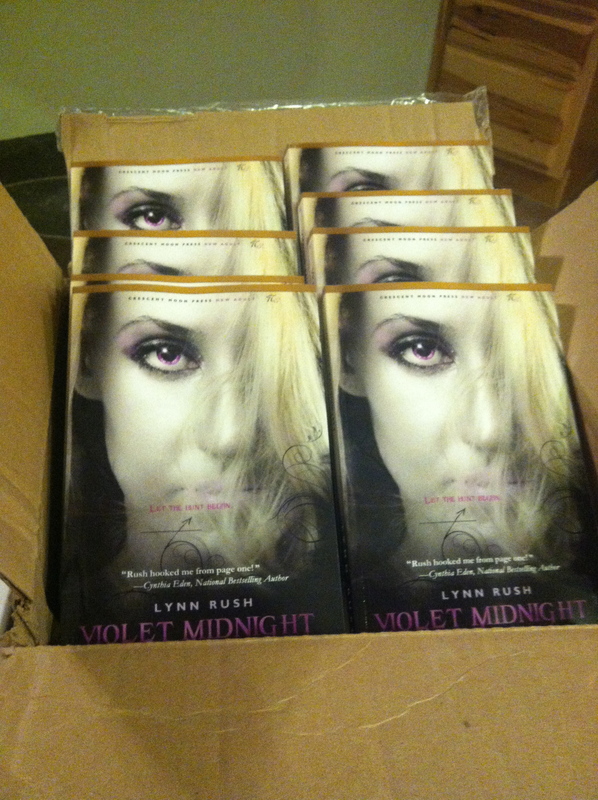 This entry was posted in Uncategorized and tagged #BuyIndie, #LynnRush, #NewAdult, #VioletMidnight, Vampires, Violet Midnight by Lynn Rush. Bookmark the permalink. Congratulations on your book and you wonderful dedication. I’m sure that she would be just as proud of you as you would have been of her. Great blog, Lynn. I wondered why you donated part of your proceeds to Cancer. My dearest friend died of breast cancer at 32 leaving behind three little ones. Kudos to you. Oh dear. 32? Darn cancer!!!! Thanks, Louann! Always a thrill to get copies of the book! Lynn would be delighted with the dedication. Thanks, ALEX! It is an exciting part of the process for sure. Your books look wonderful! Congratulations! I’m sure your friends and family, Lynn included, are all proud of you. 🙂 Thanks for sharing! Congrats on your amazing accomplishments. Lynn is totally with you in spirit and loving every moment of your journey. Hugs! Thanks, Kendall!!! 🙂 I’m glad you’re with me on this journey!! Thanks, Amy. It’s a exciting time for sure! Never thought I’d be here, but I’m glad to be. And thank you for the kind words. Lynn was a stunning example of selflessness and courage. I learned so much from her. THANKS!